After several months of being surrounded by a total absence of color and temperatures well below zero, we hit 50 degrees for the first time last week. Here in Minnesota, that is equal to about 80 degrees anywhere else. So, after a long cold winter of eating soups , stews and hotdishes, that got us talking at Curtis Food Recruiters about the foods we were most looking forward to eating this summer. For those in the warmer climates, this may not be something that is thought much about, but for us in the northern areas, it is a hot topic, right along with discussing the weather and various aches and pains! 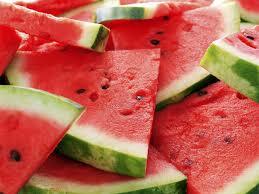 Watermelon – bright red, seedless, juicy and sweet. Fresh raspberries – they make a great vanilla ice cream topper! Green beans – picked right out of the garden and cooked with a little butter and salt until tender. Yum! Anything barbequed on the grill. Fresh heirloom tomatoes – picked right off the vine. They are awesome in a caprese salad with a variety of red, yellow and orange hues. Anything on a patio – preferably Mexican. Fresh Strawberries – it’s best to find a patch and go pick your own. Guacamole and chips – with lots of fresh cilantro. Corn on the cob – dripping with lots of hot melted butter. Potato salad – made with lots of mayo so it’s not too dry, a little mustard , salt and pepper. Even though some of those in the south may not understand how much we think about these foods, I think we can all agree that they make the warm weather so much more enjoyable! What food are you looking forward to eating this summer? http://www.trumpeterswanfarm.com/csa.htm – They offer the option to add eggs and home delivery to their CSA program in Buffalo, MN. http://www.untiedtswegrowforyou.com/ – CSA, roadside stands throughout central MN, as well as a Minneapolis farmers market favorite. http://www.bromansgreenhouse.com/ – Roadside vegetable stand at their farm in Corcoran, MN. http://www.maplegrovemn.gov/around-the-city/farmers-market – Open Thursday afternoons, June 11 to October 22, 2015.
http://mfma.org/pages/CityofWhiteBearLakeFarmersMarket/ – Open Friday Mornings, June 26 – October 30, 2015.